Place of Death: Detroit, Michigan, U.S.
Rosa Parks was an American civil rights activist. The United States Congress has called her “the first lady of civil rights” and “the mother of the freedom movement”. Rosa was the daughter of Leona (Edwards) and James McCauley. She was African-American. One of her maternal great-great-grandfathers was Irish. A picture of Rosa’s father can be seen here. 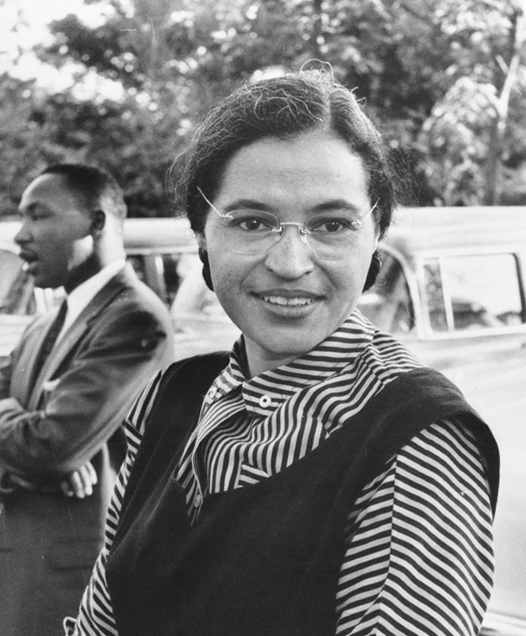 Rosa was married to barber and NAACP staffer Raymond Parks, until his death. All of Rosa’s grandparents were black. Rosa is sometimes described as having had some degree of Cherokee Native American, Creek Native American, and/or Scots-Irish/Northern Irish ancestry. It is not clear if any or all of these lineages have been verified/documented. Rosa’s paternal grandfather was named Anderson McCauley. Anderson was born in Alabama or Georgia. Rosa’s paternal grandmother was named Louisa Collins. Louisa was born in Alabama. Rosa’s maternal grandfather was Sylvester Edwards (the son of John Earl Edwards and Rosa Jones). Sylvester was born in Alabama. John was the son of James Earl Edwards and Martha Patsy Hamilton. Rosa’s great-grandmother Rosa Jones was the daughter of Joseph Jones and Mary Potter. Rosa’s maternal grandmother was Rose Percival (the daughter of James Percival and Mary Janes Nobles). Rosa’s grandmother Rose was born in Alabama. James’s father was Irish. When rachel dolezal made that claim, and the truth came to light, she ostracized for it. you must have missed that part. it appears that Anderson McCauley was the son of Capt. Charles Maurice Tallyrand McCauley, of Cherokee and Irish background, and of Ghiogee, a full-blooded Poarch Creek Indian.